On August 11, about 250 American militia advanced from their fortified camp and occupied a recently abandoned battery about a quarter mile (400 m) from the British fort. As expected, a sortie of about 55 British troops advanced from the fort to engage. But the poorly trained American troops fired only one volley at the attacking British troops and fled back to their fort, leaving behind all their arms and equipment. 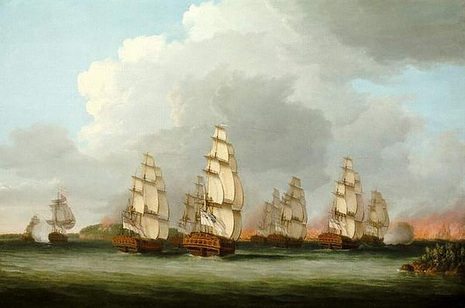 The next day, Saltonstall finally decided to launch a naval attack against the British fort, but the British relief fleet arrived and attacked the American fleet. 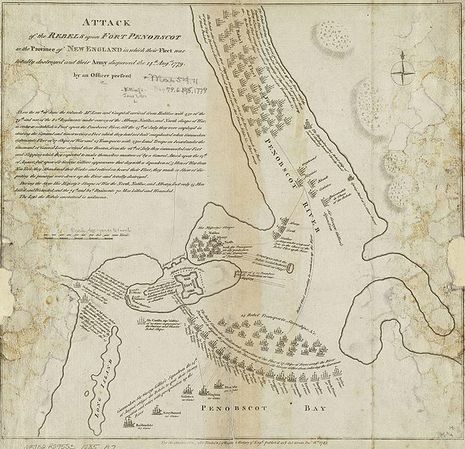 Over the next two days, the American fleet fled upstream on the Penobscot River, pursued by the British fleet. Several vessels were scuttled or burned along the way with the rest destroyed at Bangor. In the 1700s there were rapids at Bangor at the approximate location of the old Water Works. The surviving crews then fled overland back to Boston with virtually no food or ammunition. On July 25, the American warships entered Penobscot Bay. By this time, British naval commanders had good intelligence of the American force's composition and destination, and were preparing to find and destroy it. When the Saltonstall's expedition first arrived in Penobscot Bay, British forces had only partially completed a dirt fortification, named Fort George, on the heights of the Majabagaduce peninsula. However, the three Royal Navy sloops, each mounting 18 guns, remained anchored in the bay nearby. A small party of British troops also had established a minor fortification on Nautilus Island just to the south of Majabagaduce peninsula. Hence, British gunners on land and on board the warships were able to engage in a desultory 2-hour duel with the American expeditionary task force as it entered the bay, which inflicted little or no damage on either side. Initially, things went well for the revolutionary forces.